Improve your IT performance with our bespoke IT support services, including real time alerts and proactive performance monitoring. Our expert team of friendly professionals can create a completely tailored IT system to suit your business needs, based on the work you do. After discussing requirements, we advise and install the best practises so our services work perfectly for you. Through understanding your current system capabilities and what your business requires to run efficiently, we can protect your files, software and hardware, as well as upgrade or downgrade your storage size depending on usage. To gain peace of mind and security from our services, find out more about what we offer below and call us on 01403 290 321 or 01293 912321 with your enquiry. 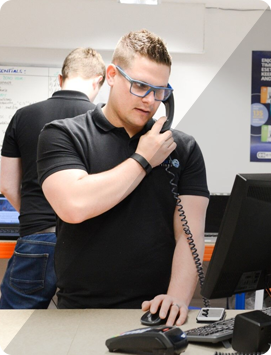 We use advanced tools to monitor the performance of your IT systems 24/7 and through real time alerts we’re able to immediately work on fixing issues as they arise. This may include server problems or failure, lack of storage and underperformance of Wi-Fi connections. If you find anything not running smoothly, you can contact us for diagnostic checks where we may suggest improvements based on our findings. Businesses require a fast and accurate response to issues to ensure there’s no detrimental effect on your workflow. This is why we reliably diagnose issues and respond in the correct way to limit downtime and disruption. Once we’re monitoring your performance, any issues from small simple-fixes to complicated and critical problems can be dealt with swiftly, including system failure. As part of our proactive approach we’ve partnered with Dropbox, the cloud based storage and backup solution. Utilising a cloud based system removes the need for large and distracting storage in-office and to complete time-consuming manual back-ups. As an official partner of Dropbox, we are able to offer this fantastic storage solution as part of your ongoing support package. That means unlimited storage, unlimited back-ups and industry-leading encryption to keep your data secure. Our team can also take on the management of your email services, improving your communications internally and with clients and customers. All emails and attachments will be sent securely without the concern of hacks or virus attacks. Our Hosted Exchange email service is a fully managed solution so you no longer have to worry about the security, integrity or delivery of your emails ever again. Discover more about how we can help your business communicate securely and efficiently by clicking here.